Greetings again from the darkness. Divorce is rarely simple or clean or amicable. By definition it changes people’s lives and is typically cluttered by a wide range of emotions that distort one’s thoughts. When kids are involved, the process is even more delicate, even treacherous. 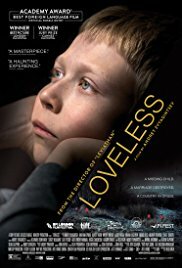 Russian filmmaker Andrey Zyyaginstev and his co-writer Oleg Negin follow up their exceptional Oscar nominated LEVIATHAN (2014) with this very intimate project focusing on the tragic impact of resentment and self-centeredness. They have been rewarded with another Best Foreign Language Film Oscar nomination, and deservedly so. The film begins with stark, almost harsh music as a young boy walks home in the woods after a day of school. Later that evening, his parents are involved in an extremely vicious and demeaning argument. The camera then glimpses the boy from the woods, their son Alyosha (Matvey Novikov), behind a door. He has overheard the entire argument and is devastated, quietly sobbing and unable to deal with words no child should hear. As viewers, we too are overwhelmed. Zhenya (Maryana Spivak) and Boris (Aleksey Rozin) are the boy’s parents, and to say they dislike each other is an understatement. She is a salon owner and he is a generic “salesman” at a Christian company that doesn’t allow divorced employees. She is focused on her phone and new lover, while he is worried about losing his job while his girlfriend (Marina Vasileva) is pregnant. They are fighting over who should raise their son. Neither want him. With each of these despicable people going about their business, neither notice that the boy doesn’t come home one night. A teacher calls to say he has missed two days of school. It’s at this point where the tone shifts from poor parenting to lackluster police work. In what could be described as the polar opposite of an ‘Amber Alert’, the Russian police rule it a runaway, and in ho-hum manner suggest that the parents give him a few days to return home. This lackadaisical approach lead Zhenya and Boris to turn to an organization that specializes in locating lost kids. The coordinated search creates a quiet tension that is quite effective. Cinematographer Mikhail Krichman’s camera work is extraordinary as it tracks the searches through the forest and an abandoned building that could be a character unto itself. The parents head to the home of Zhenya’s estranged mother. What follows is one of the most explosive movie scenes of recent years. Natalya Potapoya plays the mother and delivers a memorable no-holds-barred diatribe at her daughter Zhenya, who refuses to fight back. We easily understand how a disconnect between parents and kids can gain traction across generations. The brilliance of the movie is in how we somehow maintain empathy for all of these less-than-ideal people. When Zhenya calmly pronounces that her mother is “God and the Devil rolled into one”, we understand her point while at the same time hope it stimulates self-analysis. Although we do get a rare Jill Stein reference, it’s quite easy to spot the differences between story-telling in Russia and the United States. It wouldn’t be surprising to see a Hollywood remake, but it would likely tread a bit lighter on the dwelling of past mistakes without losing one’s humanity, and it would surely come up with a more Americanized ending. The detail in Zyyaginstev’s filmmaking is exceptional, and while it may not be entertainment for the masses, the film is a prime example of cinema as emotionally powerful art. This entry was posted on Thursday, March 1st, 2018 at 7:55 pm and is filed under Drama, World Cinema/Foreign. You can follow any responses to this entry through the RSS 2.0 feed. You can leave a response, or trackback from your own site.